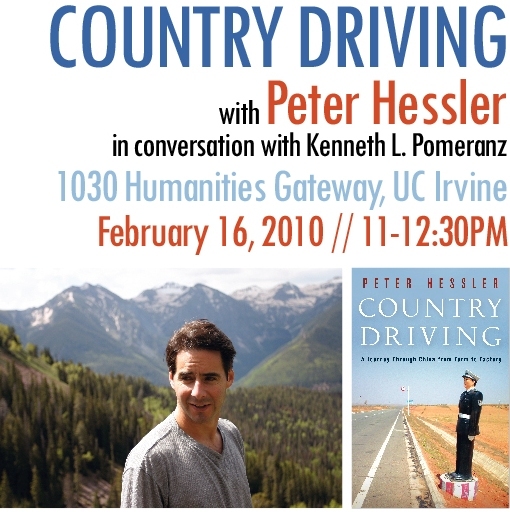 This episode of the Making History Podcast features New Yorker writer Peter Hessler (author of the books River Town , Oracle Bones , and Country Driving: A Journey Through China from Farm to Factory ) in conversation with Professor Kenneth L. Pomeranz, on where China’s been and might be heading. This latest episode of the podcast is a joint venture with The China Beat blog, and was also supported by several UCI organizations including the Department of History, the Humanities Collective, and the Center for Asian Studies. This entry was posted in events, podcast and tagged China, China Beat, China history, Country Driving, Ken Pomeranz, Kenneth Pomeranz, Peter Hessler. Bookmark the permalink.